This is mostly meant to give you a chuckle, but there is some validity to it as well. In my last blog post I talked about how we need to challenge the limits of what we understand agile to be. 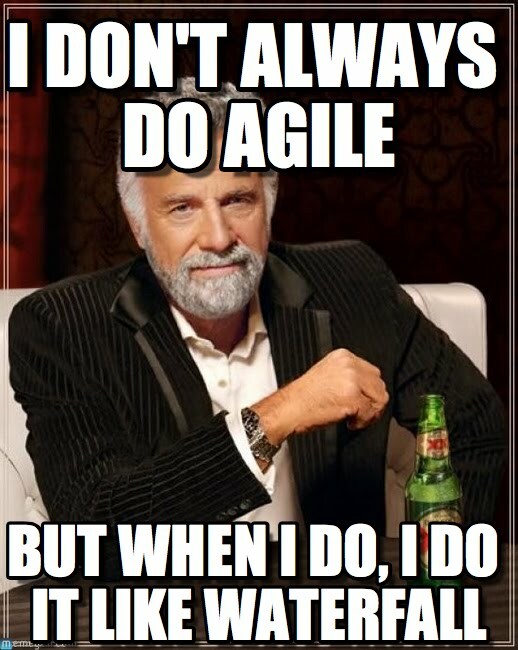 Can you be agile and waterfall at the same time? Probably not if you look through the lenses of what we typically view as a waterfall process. But it’s possible. One thing I’ve noticed as an agile coach is that people like to gravitate towards what they know and are more comfortable with. One way this can play out is when helping a team adopt agile, you can get a strong pull to keeping things in the box of a waterfall process. This happens both at the individual contributor level and management level. Management can sometimes want waterfall type metrics but without the changes needed to realize the true benefits of agile. It’s ok though. Be patient, and see if you can find a way to meet somewhere in the middle. Waterfall isn’t bad. In fact it has tremendous value in the right context. So, as an agile enthusiast make sure you aren’t always negative about waterfall especially when it could be used to your advantage. However, what you don’t want to do is fall into the trap of using the buzz words from agile/scrum but keeping things pretty much the same.